Seyfarth Synopsis: Four years and two motions to dismiss based on the pleadings later, the National Association of the Deaf’s (NAD) online video captioning lawsuit against Harvard is moving forward to fact discovery. On March 28, Federal Magistrate Judge Robertson in the District of Massachusetts denied the university’s motion for judgment on the pleadings with some notable discussion about whether websites are places of public accommodation under the ADA and limitations of liability for third party content. Physical Nexus Argument Rejected. The First Circuit has held in a case about an allegedly discriminatory insurance policy that a business can be a public accommodation covered by Title III of the ADA even if it is not associated with a physical place where customers go. Harvard argued that this precedent did not apply to cases involving websites, but the Court was not persuaded. The Court also said that even if the law did require Harvard’s websites to have a nexus with a good or service provided at a physical location, the Plaintiffs had sufficiently alleged such a nexus because some of the allegedly inaccessible videos could, for example, pertain to courses taught at the school. University Content Posted on Third Party Websites. The Court said whether Harvard could be legally responsible for content it posts on third party websites (e.g. YouTube, iTunesU, and SoundCloud) depends on facts which have yet to be developed, including whether the university has control over how the content is displayed, and whether captioning the content would provide meaningful access. The Court also noted that the university may be able to show that providing captioning would fundamentally alter the nature of the service provided or be an undue burden. CDA Immunity for Third Party Content. In a meaningful initial victory for Harvard, the Court acknowledged that the Communications Decency Act (CDA) shields Harvard from liability under Title III of the ADA and the Section 504 of the Rehabilitation Act with respect to two categories of content: (1) content hosted on a third party-server (not belonging to Harvard) that is hyperlinked in its existing form to content that is hosted on a Harvard platform or website (“Embedded Content”) and (2) content is hosted on a Harvard platform or website that Harvard did not create, produce, or substantially alter (“Third Party Content”). The CDA shields website operators, including educational institutions, from being treated as the publisher or speaker of material posted on the website by third party users. While the Court’s holding reduces the number of videos that remain at issue in the case, the Court was not willing to immediately exclude all content posted by students, individual faculty members, or other scholars as requested by Harvard. The Court said discovery into Harvard’s role with respect to such content is needed to see if it really is third party content exempted by the CDA. To Be Continued… We will continue to monitor this long- running case. NAD filed the lawsuit in 2015, alleging Harvard violated Title III of the Americans with Disabilities Act (ADA) and Section 504 of the Rehabilitation Act by failing to provide closed captioning for thousands of videos on its websites. In November 2016, the court denied Harvard’s motion to stay or dismiss on the primary jurisdiction doctrine, finding the court did not need the DOJ’s expertise to rule on the issue. The present order noted that in the time intervening the two motions, the parties engaged in settlement talks and negotiations to resolve or narrow the issues, but could not reach an agreement. Seyfarth Synopsis: Domino’s Likely to File Petition for Certiorari from Ninth Circuit’s Ruling in Robles v. Domino’s. As we reported, the Ninth Circuit held in January that a blind plaintiff could move forward with his ADA Title III lawsuit against Domino’s Pizza for having an allegedly inaccessible website and mobile app. The court determined that allowing the claim to move forward was not a violation of Domino’s due process rights, even though the ADA and its regulations contain no definition of, or technical specifications for, “accessible” public accommodations websites. We believe Domino’s will be petitioning the U.S. Supreme Court for certiorari because on March 6, 2019, it requested a sixty-day extension of time to file said petition. The request was filed by a newly-engaged Supreme Court specialist which further confirms our conclusion that a petition will be filed. Justice Kagan granted the request, and Domino’s Petition for Certiorari is due on June 14, 2019. There is a lot at stake with this petition. Congress and the DOJ have taken no action to stop the tsunami of lawsuits against thousands of businesses about their allegedly inaccessible websites. A Supreme Court decision could put an end to the litigation frenzy and provide some relief for businesses. Stay tuned for updates on this exciting development. Seyfarth Synopsis: DOJ provides guidance on sales/service counter rules in the 2010 Standards that provides some relief to businesses. Retailers and other businesses should be pleased with the DOJ’s pronouncement on February 25, 2019, that they can lawfully provide sales/service counter space that is less than 36” long, as long as the entire space is at an accessible height of 36” or lower. While we always thought the 2010 ADA Standards for Accessible Design (“2010 Standards”) were unambiguous on this point, plaintiffs filed many lawsuits claiming the ADA requires retailers to provide a minimum 36” length of lowered accessible counter that is entirely clear of all objects. Courts have reached different conclusions, and now the DOJ has weighed in. While this DOJ pronouncement provides much needed clarification, businesses should consult their ADA Title III specialist attorneys before filling up their accessible lowered counters with anything more than a register and some merchandise displays, particularly if high counters are provided for use by non-disabled customers. As we had predicted, the number of website accessibility lawsuits (i.e. lawsuits alleging that plaintiffs with a disability could not use websites because they were not coded to work with assistive technologies like screen readers, or otherwise accessible to them) filed in federal court under Title III of the ADA exploded in 2018 to at least 2258 – increasing by 177% from 814 such lawsuits in 2017. Plaintiffs filed these federal ADA Title III lawsuits in fourteen states—New York and Florida being the most busy jurisdictions with 1564 and 576 lawsuits, respectively. Pennsylvania and Massachusetts held distant third and fourth positions, as shown in the chart below. The number of New York federal website accessibility lawsuits is staggering, brought primarily by fifteen law firms/lawyers. The lawyers appearing most frequently on filings are Joseph Mizrahi, Jonathan Shalom, Doug Lipsky, C.K. Lee, Bradley Marks, and Jeffrey Gottlieb. We saw a surge in these cases after New York federal judges allowed website accessibility cases to proceed to discovery in lawsuits against Blick Art and Five Guys. The 2018 New York website accessibility filing statistic brought New York into a close second to California in the total number of ADA Title III lawsuits (not just website accessibility cases) filed in federal court. The fact that the California federal courts only had ten website accessibility lawsuits filings in 2018 may be a surprise to some since California continues to lead the pack in the number of all ADA Title III lawsuit filings in federal court. However, it appears that plaintiffs filed their new cases in state court after a federal judge in the Central District of California dismissed a website accessibility lawsuit against Dominos’ in 2017. The Ninth Circuit reversed that dismissal last month, making California federal court an attractive venue for plaintiffs once again. We predict that the Ninth Circuit’s ruling will cause the number of website accessibility lawsuits in California federal courts to increase dramatically in 2019. About our methodology: Our 2018 numbers are based on searches using keywords of data from the Courthouse News Services. Thus, it is possible that there are some website accessibility cases that were not captured in the searches if their descriptions did not include the keywords. We then review the thousands of entries manually to remove lawsuits that may be about websites but are not about a website’s accessibility to a user with a disability. For example, there were a number of lawsuits in 2018 brought by plaintiffs with mobility disabilities alleging that the reservations websites of hotels did not provide adequate information about the accessibility of hotel facilities. We also removed a number of lawsuits brought against state and local government entities under Title II of the ADA for having inaccessible websites. California, New York, and Florida led the pack by a wide margin as the states with the most ADA Title III lawsuits, with Texas, Georgia, Pennsylvania, Arizona, Massachusetts, New Jersey, and Alabama making the top ten but trailing far behind. Nevada, Colorado, and Utah fell out of the top ten in 2018, displaced by newcomers Alabama, Arizona, and Massachusetts. No ADA Title III lawsuits were filed in Montana, New Mexico, North Dakota, South Dakota, Vermont, Wyoming. 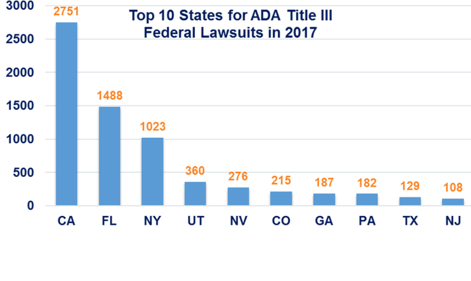 [Graph: Top 10 States for ADA Title III Federal Lawsuits in 2018: CA 4249, NY 2338, FL 1941, TX 196, GA 160, PA 129, AZ 94, MA 91, NJ 82, AL 80. The big news among the top three states is that New York displaced Florida as the second busiest jurisdiction. Filings in New York more than doubled from 2017 to 2018 (1023 vs. 2338) while the number of cases filed in Florida only increased from 1488 to 1941. The number of lawsuits filed in California increased by 54% from 2751 in 2017 to 4249 in 2018. This record-breaking California number does not even include the many state court filings which we do not track. What is driving the ADA Title III lawsuit explosion? We are still crunching the numbers but we believe there were nearly 2000 federal lawsuits about allegedly inaccessible websites filed in 2018. There were very few of these cases before 2015. In addition, plaintiffs and their attorneys branched out into suits about hotel reservations websites in 2018, further driving the numbers. We also continue to see many lawsuits about physical access barriers. A note on our methodology: Our research involved a painstaking manual process of going through all federal cases that were coded as “ADA-Other” and manually culling out the ADA Title II cases in which the defendants are state and local governments. The manual process means there is the small possibility of human error, but we are confident in our process. Seyfarth Synopsis: Ninth Circuit overturns district court’s dismissal of website accessibility lawsuit on due process and primary jurisdiction grounds, remands case to proceed with discovery. On January 15, 2019, the Ninth Circuit Court of Appeals issued the fifth federal appeals court ruling on the issue of website accessibility, and there is no doubt that it is a victory for plaintiffs and their lawyers. However, there are some pro-defense nuances that are worth pointing out. By way of background, the district court had concluded that the ADA does apply to Domino’s website and mobile app, but dismissed the lawsuit before discovery because: (1) Holding Domino’s in violation of the ADA when there are no legal technical standards for public accommodations websites would be violation of due process; and (2) under the primary jurisdiction doctrine, courts should hold off on deciding cases where enforcement agencies with special expertise should weigh in first. The Ninth Circuit agreed with the district court that the ADA applies to Domino’s website and app. In so doing, the court said that the ADA “applies to the services of a place of public accommodation, not services in a place of public accommodation.” The Ninth Circuit did not agree with the district court on the due process point, however, finding that Domino’s has been on notice since 1996 of DOJ’s position that its website and app must provide effective communication. (We note, however, that none of the DOJ documents cited by the court actually mention mobile apps.) The Ninth Circuit also said the district court erred in applying the primary jurisdiction doctrine, noting that since the DOJ is not going to issue any regulations about websites and mobile apps, applying the doctrine would just “needlessly delay” the resolution of the claim, and the application of the ADA to the facts of the case “are well within the court’s competence.” The Ninth Circuit’s rejection of these due process and primary jurisdiction arguments, which are often mounted by defendants in website accessibility cases, is not entirely surprising as many district courts have also reached the same conclusion, and the district court’s decision in this case was an outlier. The Ninth Circuit concluded by making clear that it was not expressing any opinion about whether Domino’s website or mobile app comply with the ADA. The court instructed the district court to proceed with discovery and then decide whether Domino’s website and app comply with the ADA’s effective communication and full and equal enjoyment mandates. From the defense perspective, there are several useful points in the decision. Second, the Ninth Circuit left open the possibility that a 24/7 toll-free phone line could be a way to provide access in lieu of an accessible app or website. The court did not have to consider the question of whether a telephone hotline could be an adequate alternative to an accessible website or mobile app because the district court’s holding was not based on the phone line. However, the Ninth Circuit said in a footnote that “the mere presence of a phone number, without discovery on its effectiveness, is insufficient to grant summary judgment in favor of Domino’s.” This statement suggests that, with discovery on the effectiveness of the phone line, summary judgment for Domino’s could be a possibility. Fourth, the Ninth Circuit said that “due process constrains the remedies that may be imposed.” Thus, defendants may be able to make the due process argument later in a case if a violation of the ADA is found and the court must fashion injunctive relief. In sum, while this decision adds to the growing body of website accessibility case law that favors plaintiffs, there are some useful nuggets. That said, we predict the number of website accessibility lawsuits in California federal courts will increase dramatically in 2019. While this case was on appeal, plaintiffs largely opted to file their website accessibility cases in California state court but this decision clears the way for more federal filings. Seyfarth Synopsis: A new Ohio law will require notice and opportunity to cure as a prerequisite for a plaintiff’s recovery of attorney’s fees in physical accessibility lawsuits. Businesses across the country have been asking Congress to provide some relief from ADA “drive by” and “gotcha” lawsuits about physical access barriers at public accommodations facilities. Federal efforts to amend the ADA stalled early in 2018, but a new Ohio law may provide businesses in that state with some advance notice and an opportunity to cure physical access violations before being held liable for paying the plaintiff’s attorney’s fees – at least under Ohio accessibility laws. In 2018, the U.S. House of Representatives passed the ADA Education and Reform Act of 2017, H.R. 620, which would have prohibited a plaintiff from filing a federal ADA lawsuit based on failure to remove an architectural barrier unless the plaintiff has first given the businesses notice of the alleged violations and an opportunity to provide a plan to address them. H.R. 620 gained no traction in the U.S. Senate, however. Ohio Governor Kasich recently signed House Bill 271, which will require a plaintiff, to be eligible for attorney’s fees, to provide a notice of an alleged accessibility law violation in advance of filing a civil action. After serving notice, the plaintiff cannot file a lawsuit until the property owner or responsible party fails to respond or fails to remediate the violations under certain conditions and in certain time frames. A plaintiff who provides notice but fails to allow the defendant opportunity to remediate the property as specified in the bill may forfeit entitlement to attorney’s fees, as specified in the bill. That said, a plaintiff who does not provide notice may still be able to recover fees if the trial court determines attorney’s fees are appropriate due to the nature of the violations. House Bill 271 says it applies to alleged violations of Ohio and federal accessibility laws (except housing discrimination), but since no state law can affect the remedies and procedures available under the federal ADA, it will not impact the recovery of attorney’s fees in ADA lawsuits. Time will tell as to whether this legislation will cause a decrease in the number of physical accessibility lawsuits filed in Ohio, but we remain skeptical. Seyfarth Synopsis: The Department of Transportation says that an airline’s provision of an accessible alternative website violates the Air Carrier Access Act (ACAA), so are such websites an acceptable means of providing access under the ADA? In response to the onslaught of website accessibility lawsuits against public accommodations covered by Title III of the ADA, some website accessibility consulting companies have been promoting solutions that involve the use of an alternative version of a business’ primary website that conforms to the Web Content Accessibility Guidelines 2.0 AA (WCAG 2.0 AA). The alternative version is typically accessed through a link on the website and, unlike the bare bones “text-only” websites of the past, looks very much like the non-accessible website. While not cheap, this solution is appealing to many businesses because it requires no coding changes to the primary website, no substantial commitment of internal company resources because it is implemented by the third party consultant, and can be implemented fairly quickly to provide immediate access for users with disabilities. In a recent consent order against airline SAS, the Department of Transportation (DOT) made clear that these alternative websites do not meet the Air Carrier Access Act (“ACAA”) requirement that all airlines make all web pages on their primary websites accessible by December 12, 2016. The DOT said SAS violated the ACAA’s website rules when it when it “created a separate Web site for individuals with disabilities instead of ensuring that its primary Web site met the Web Content Accessibility Guidelines (WCAG) 2.0 Level AA standard.” To avoid an enforcement action, SAS entered into a consent order which requires SAS to pay $100,000 in immediate penalties, and other $100,000 in penalties if it later violates the Consent Order. The airline had engaged a well-known website accessibility consulting company to create an “assistive version” of its primary website which had a separate url from the airline’s primary website url, and could be accessed from a link on the top right of the primary website homepage. The airline stated that it had in good faith employed this solution to meet the compliance deadline while it was building a new global primary website that would be (and is now) accessible. It also argued that it met the undue burden exception to the website rule, which, when met, allows use of an alternate conforming website. DOT responded that the ACAA permits air carriers to use a WCAG Level AA conforming alternate version only when conforming the primary web page to all WCAG 2.0 AA success criteria would constitute an undue burden or fundamentally alter the information or functionality provided by the primary webpage, and that SAS could not meet either exception. The DOT cited the ACAA’s explanation for its prohibition on separate accessible websites, as “likely [to] perpetuate the problem of unequal access as carriers allot fewer resources than needed over time to properly maintain the secondary site.” However, the Consent Order did not state that the alternative website failed to comply with the WCAG 2.0 AA in any way. The DOT also rejected SAS’s argument that it was only using the alternative website to meet the deadline while its entirely new accessible primary website was under development. We assume that SAS, like many other businesses, did not want to spend money remediating an old website that would soon be retired. The DOT Consent Order raises the obvious question of whether an alternative accessible version of an inaccessible website can be used to provide access under Title III of the ADA. We do not think the DOT Consent Order is dispositive because, unlike the ACAA which explicitly says the primary websites of airline carriers must comply with WCAG 2.0 AA, the ADA does not specify any accessibility standard for public accommodations websites. In fact, the Department of Justice (DOJ) which is responsible for enforcing the ADA recently stated in a letter to Congress that “absent the adoption of specific technical requirements for websites through rulemaking, public accommodations have flexibility in how to comply with the ADA’s general requirements of nondiscrimination and effective communication.” That said, the Consent Order certainly raises concerns about the use of alternative accessible websites, and public accommodations should carefully examine their options before signing up for this type of solution. Seyfarth Synopsis: The Court of Appeals for the First Circuit says that an agreement to arbitrate presented visually to blind plaintiffs on a POS device and never read to them is not binding. Season’s greetings! As the holiday season ramps up, retailers’ point-of-sale (“POS”) devices will again go into overdrive facilitating the holiday check out process and enrolling new loyalty program members. Retailers with POS devices that are not fully accessible to the blind should be aware that any loyalty program terms and conditions presented on these POS devices may not be binding on customers who are not able to read them because of a disability. Retailers should, at a minimum, put procedures in place to ensure that such terms are read to customers who are blind or have low vision, and make a contemporaneous record of this fact. The First Circuit recently addressed this issue in National Federation of the Blind v. The Container Store, Inc. According to the Second Amended Complaint, The Container Store uses its touchscreen POS devices to enroll customers into its loyalty program. To enroll, customers must enter their phone number and email address. They must also enter this information to receive program benefits. The blind plaintiffs allege that The Container Store’s POS devices did not allow them to input this information independently. They allege that they should not have to reveal this private information to store employees and that The Container Store had violated the ADA and various Massachusetts state laws. The Container Store filed a motion to dismiss arguing that the plaintiffs had agreed to an arbitration provision when they signed up for the program. This provision appeared on the POS device visually and there was no evidence that any employees read the provision to the plaintiffs or otherwise made them aware of it. Justice Souter, sitting by designation on the panel, wrote that “the in-store plaintiffs had no way of accessing the terms of the loyalty program, including the arbitration agreement, that appeared on the touch screen [and] no store clerk actually informed them that an arbitration agreement existed as a condition of entering the loyalty program.” As a result, there is no evidence that the plaintiffs “manifested their assent to arbitrate during enrollment.” The First Circuit also found that the agreement to arbitrate was not binding because it was part of an “illusory” contract. Specifically, the agreement said that The Container Store could “change, modify, cancel, add or remove any or all portions” of the contract terms “at any time,” which the Court found was really no contract at all. With the arbitration issue resolved, this class action will continue and raises important questions about whether POS devices must be designed so that blind customers can independently input their email addresses and/or phone numbers, as opposed to just their debit card PINs. In the meantime, retailers that do use POS devices to present terms and conditions for loyalty programs should train their employees to read the terms and conditions to customers who are blind or have low vision, and refrain from imposing overreaching terms that may make the whole agreement illusory and unenforceable. Seyfarth Synopsis: Due process, DOJ’s failure to enact regulations, and whether the ADA covers websites arguments dominated the recent Domino’s Ninth Circuit oral argument. In the increasing morass of varying state and federal district court opinions in website accessibility cases, we will soon have two additional federal appellate decisions to provide more guidance of precedential value to federal trial courts. Most recently, on October 12, the Ninth Circuit heard the parties’ oral arguments in Robles v. Domino’s Pizza. On October 4, the Eleventh Circuit heard oral argument in Gil v. Winn-Dixie. We attended the Robles argument. Primary Jurisdiction/Due Process. The main issue on appeal is whether U.S. District Judge Otero erred in granting Domino’s motion to dismiss the case on primary jurisdiction and due process grounds. Robles argued that the lack of specific website accessibility regulations does not eliminate the statutory obligation to comply with the ADA, and that Domino’s is not exempted from the ADA and its implementing regulations because DOJ was working on such regulations at one time. Robles pointed out that DOJ has terminated the rulemaking process since the District Court ruled. Robles stated that the court does not need the DOJ to rule on this issue – in fact, that the DOJ said in a recent letter (to Congressman Ted Budd) mentioning this very case that it was not going to act. Frustration with DOJ’ s Inaction. Not surprisingly, the DOJ continued to come up numerous times during the Domino’s argument. Judge Watford stated that all “agree it’s a highly undesirable state for the law to be in” and “it’s DOJ that’s mainly at fault – it should have happened a long time ago.” Domino’s asked whether the Court could certify the question for the DOJ to answer. Judge Watford did not believe any mechanism to do so existed. Judge Owens interjected that the DOJ could have intervened, but did not. “This shows the problem with your primary jurisdiction argument. It’s like a Samuel Beckett play – we’re just waiting and it’s not going to happen.” Isn’t that an inherent due process problem, Domino’s asked? “The court’s job is to interpret the law as best it can.” If the Supreme Court doesn’t like it, it doesn’t like it. What is an accessible website? Domino’s argued, as a possible explanation for DOJ’s inaction: “there is no such thing as an accessible website, and there never will be.” He cited the plaintiff’s expert’s statement in Winn-Dixie, also cited by the Eleventh Circuit judges in that oral argument, that the expert had never seen a website that complies with the Web Content Accessibility Guidelines (WCAG). To illustrate the difficulty businesses face in applying the guidelines, Domino’s posited how detailed the alt-text behind a picture of a basketball needs to be to conform to the guidelines – if it has LeBron James’s autograph on it, for example, does the alt-text need to go to that level of detail, or can it just say “basketball.” He thinks the regulatory effort was stymied because the DOJ couldn’t “wrap its head around” this. Telephonic Access. At one point, Domino’s counsel stated that that people who could not use the website could call a 1-800 number. Judge Watford reminded him that banner displaying the number was not on the Domino’s website at the time Robles attempted to access it. The Judge did not say that the phone number could not provide a lawful alternative to access but said “we can debate whether that would be adequate.” Amicus Counsel for the NFB expressed skepticism about whether the phone could ever be an adequate substitute, and argued that this was an issue of fact. The Ninth Circuit will likely issue its order in the next three to twelve months. Edited by Minh N. Vu. Seyfarth’s ADA Title III team consists of attorneys with extensive experience in ADA Title III litigation located in many offices across the United States, including California where plaintiffs are most active. With additional litigators admitted to practice in virtually every jurisdiction in the country, we have the resources to defend our clients against lawsuits and investigations on a nationwide basis and provide consistent and efficient service in national engagements. We have successfully defended against or resolved hundreds of lawsuits brought under Title III of the ADA and applicable state laws.